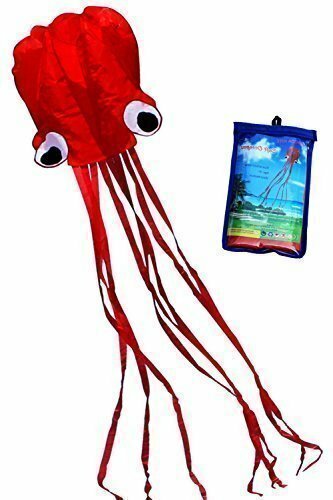 OCTOPUS KITES is very cool kite design for people to play in the park or on the beach. Just take the kite out of the bag and start to play in a minute. 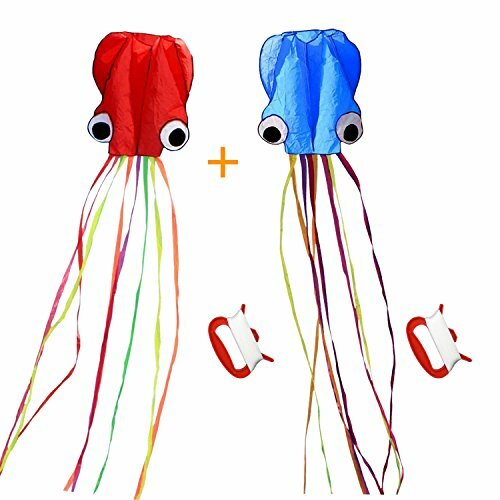 This eye-ball catching kite is easy to fly and will attract lots of kids fans. Flying kite is a good outdoor activity for kids and families. It could enhance the relationship with your kids, help them to go out for fun instead of staying at home. WARM TIPS 1. Not suitable for kids under 3 years old 2. Kids should play under the supervision of their parents 3. Do not play while the lightning is expected and stay away from the high voltage wires, roads etc. WARRANTY Every item you purchased from our shop will be packaged with 12-month warranty. If you have any issue with our kites, please email us, we will reply to you within 24 hours. Grab your kites now, we believe you will not regret. In USA amazon Two Pieces purple and orange , In the canada amazon ,only the one purple . As a parent, no one knows better than you just how quickly the years of childhood speed by... but in this day and age your children's lives are increasingly devoured by game consoles and television screens. Creating strong family memories requires time, dedication, and an activity to bring you together. An activity like flying a kite. 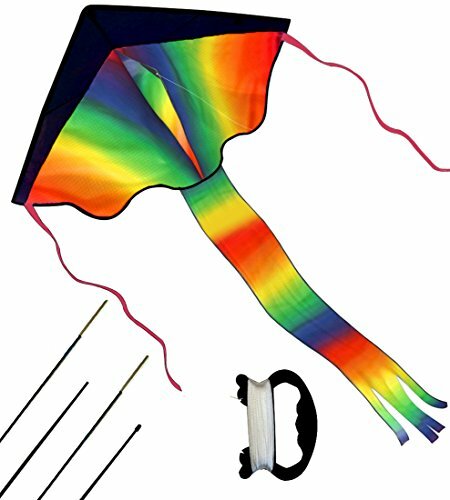 And there's no better kite to get your kids started than our 46-inch Rainbow Kite. Unlike typical kites, it's purposely designed to be stable and easy to launch in nearly every type of wind from a light breeze to a stiff blow. Versatile and stable, it's a great platform for you and your kids to learn the ins and outs of kite handling before stepping up to more complicated models. They'll build strength and coordination handling the kite, launching and recovering it, and learning how it handles in different types of wind. They'll feel the surge of pride in themselves when they get the huge, 28-inches and very long 3937 inches line wingspan airborne. And most importantly, they'll remember doing it with you, as a family. 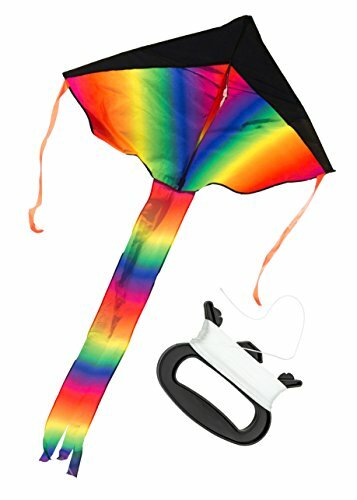 Specification: Product Size: 26.3*43.3 inches, 58.8-inch tail Type: Geometric 2D Kite Items per pack: kite, a reel with 164 ft string, 2 sets of kite rods, instructions, a storage bag Minimum Age Recommended: 3 years old HIGH PERFORMANCE TRAINBOW KITE: High quality fabric with a premium flat winder and durable 50-meter string, well-built frame. It's one of the best toys for outdoor games and activities. WARM TIPS 1. Not suitable for kids under 3 years old 2. Kids should play under the supervision of their parents 3. Do not play while the lightning is expected and stay away from the high voltage wires, roads etc. Kite flying is a funny outdoor activity that can be enjoyed by all ages. Do you want to fly kites with your families in windy days? Come on to try this Kite for your entertainment. 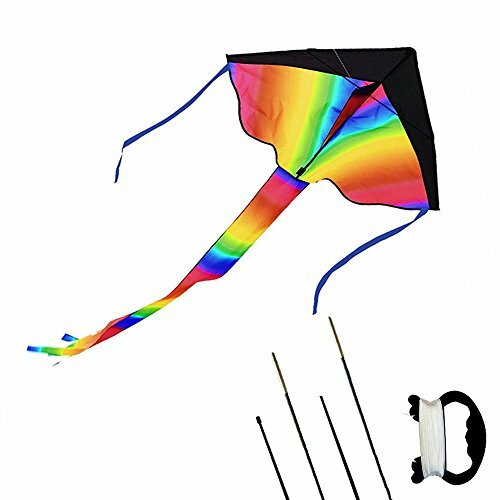 The eye-catching color, concise pattern and fine workmanship allow the kite to stand out from the crowd. Made of high-class material, it is durable and steady for high-altitude flying and lightweight for easy carrying. Additionally, the reasonable price is also attractive for each clever consumer. This kite will be your regretless choice. Dolphins are beloved by people, because they are very best friends of our people. They are cute and friendly, and we do love to play with them. With no doubt, you could not resist the charm of dolphin kites, it reminds you of real dolphins and beautiful memories will be created this time. Playing kites is an awesome outdoor activity to relax and leave fine memories with friends and families, you are sure to get a lot of fun from it! 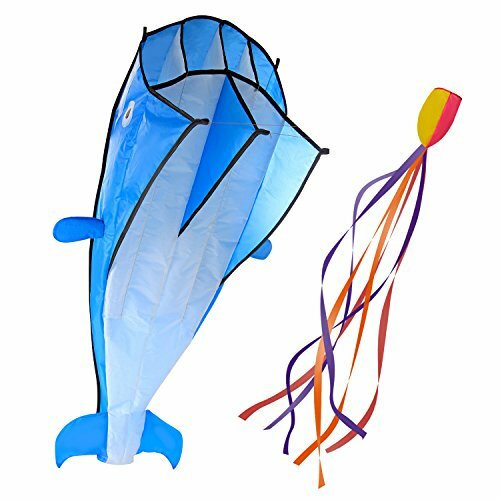 Cheap but good quality, you and your kids will never miss so cute dolphin kite! Specification: Material: Cloth Wing Dimensions: Approx (78.74 x 28.74 )in / (200 x 73)cm(L x W) Tail Length: Approx 132.28in/336cm Weight: Approx 300g Color: Blue (reference to pictures) Package Content: 1 x Kite 1 x Kite Tail 1 x 60m string Notice: Small parts. Not for children under 3 yrs. 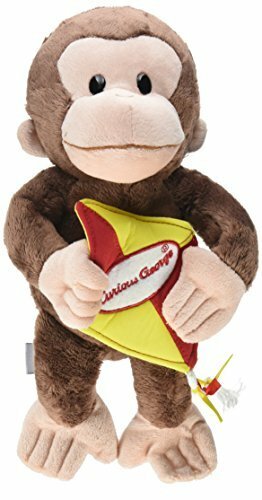 GUND has teamed up with everybody's favorite monkey — Curious George! Inspired by a popular book, this 11.5" plush is ready for a fun day at the park. Features a colorful kite embroidered with the Curious George logo. Accurate details are sure to please fans. As always, high-quality and huggably soft plush ensures that GUND products remain loyal pals for years to come. Surface-washable. Appropriate for ages one and up. About GUND: For more than 100 years, GUND has been a premier plush company recognized worldwide for quality innovative products. Building upon our award-winning and beloved plush designs, we continue to practice innovation by constantly developing new original and licensed designs to appeal to the next generation of customers. To that end, each one of our plush toys is constructed from premium materials for unparalleled softness and hug ability. 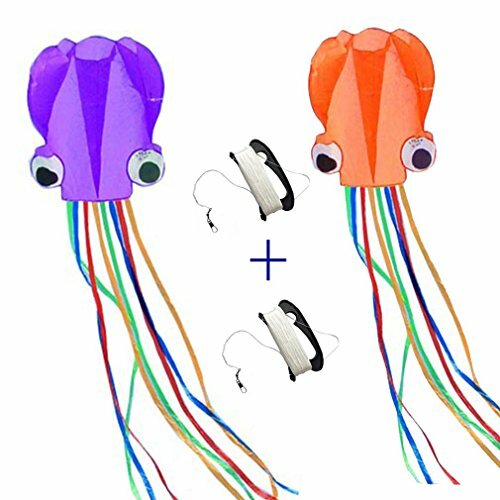 Looking for more Kite Toy similar ideas? Try to explore these searches: 128mb Nvidia Quadro, Non Chipkill Memory Kit, and Chairs Childrens Furniture. Look at latest related video about Kite Toy. Shopwizion.com is the smartest way for online shopping: compare prices of leading online shops for best deals around the web. 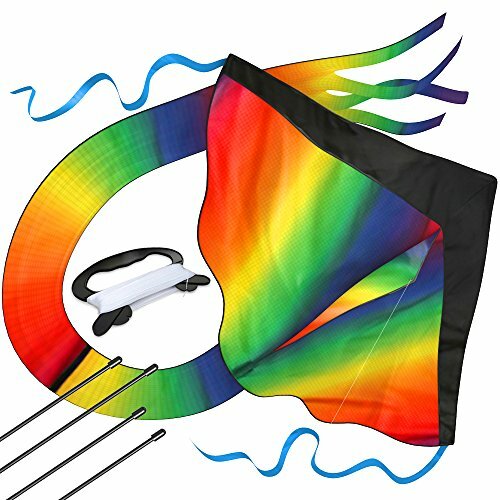 Don't miss TOP Kite Toy deals, updated daily.